In the early Middle Ages the battlefield was dominated by the mounted knight, which was just as it should be according to the nobility who provided such warriors. Scotland was not rich in such heavy knights and therefore developed alternative battle tactics based on large bodies of spearmen known as schiltrons. Such bodies seem to have had no consistent shape or size, and were simply a densely packed body of men 'bristling with spears'. Such a body was mostly defensive, although it could and would sometimes be used offensively. If it held firm then no mounted knights could defeat it, and it formed part of the shift in power from mounted knights to ordinary infantry on the battlefields of medieval Europe. Only with the coming of large-scale deployment of archers were the Scottish schiltrons defeated, teaching the English a valuable lesson in the worth of missile warfare that would serve them well in their wars on the continent. The term 'schiltron' seems to have been used quite loosely, so it is not possible to be precise about the necessary poses for such a formation. Some accounts speak of the front rank kneeling, but there are no such poses in this set of figures. What is more certain however is that the first few ranks - perhaps as many as six men deep - presented the points of their spears to the enemy to form an impenetrable barrier. It is surprising therefore that almost half the figures in this set are holding their spears upright, as they might while waiting to become involved in the battle. Of the remainder, many are holding their spears tilted forward, which is fine, and a few are holding theirs horizontally at waist height, which would have done relatively little to discourage cavalry although would certainly have still had some effect. We would have liked to have seen some kneeling men with spear sloped forward, and some holding the spear at shoulder height, letting it pass over the shoulders of the front ranks to add to the hedge effect. With the same few poses repeated many times we felt this was not a particularly realistic representation of how such a formation would have appeared, even though the poses themselves are not without merit. Strelets do not attempt to date this set, but all the figures seem to be quite well equipped with armours of various sorts and a full set of clothes. Descriptions of Scots spearmen of the early Middle Ages speak of bare feet or bare legs, and a very shabby appearance with very little protective clothing, so these men would seem to be more at home in the later period, arguably from the time of Wallace and the Bruce onward. They wear a wide variety of clothing which would be no different from that in any other European army, but the fact that all have helmets and many have full mail means the set presents a remarkably well turned out group of men which may have been a little nearer to the ideal than the reality most of the time. However there is nothing apparently inaccurate about any individual figure, although we could find no reason why such a high proportion have been modelled with purses hanging from the front of their belts. 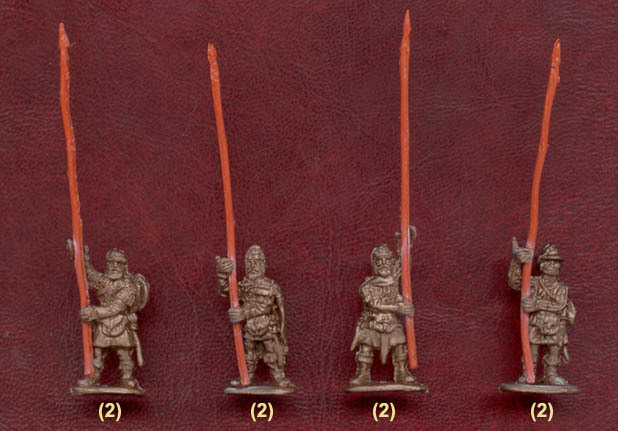 The spears or pikes come on a separate sprue as shown and are all identical, being about 52mm (3.75 metres) in total length. This is a pretty good length, although the actual length varied somewhat at the time. They come off the sprue at several places and are sometimes a little curved although they respond well to being straightened. They are quite slim and well proportioned, and plenty good enough for the task. The sculpting is standard Strelets, with fair detail but quite chunky and unrefined. There is no flash at all and no areas of excess plastic, mainly because the poses have been carefully chosen to work well in a simple two-piece mould. Having separate spears helps of course, but the poses are still somewhat flat. However the problem with the separate spears is revealed when you come to add them to the figures. All have cupped hands which are supposed to accommodate the spears, but in very many cases these are not well aligned, not properly cleared or simply cannot hold the spear without forcing it to be curved around the body. Our pictures show this to a degree, but do not always show where a spear has had to be bent round a stomach or some other part of the body. 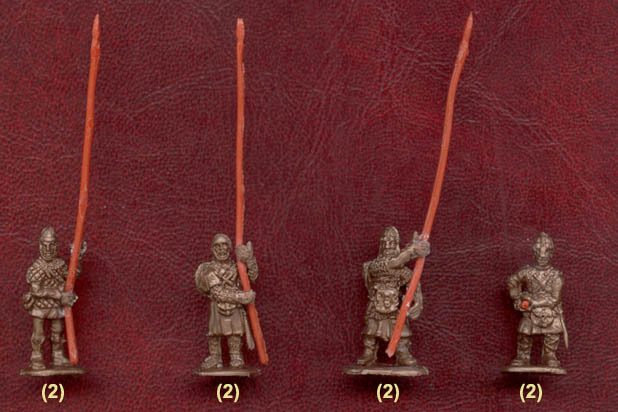 Having hands that line up would seem like a basic requirement for such a set, yet the fact that manufacturers frequently fail to deliver this suggests that this is a difficult thing to achieve, even though it seriously detracts from the look of the set as no one went into battle with such curved spears as these. Much filing can of course remedy all this, but this should not be necessary and the customer is entitled to expect better. Although Schiltron originally meant shield wall, handling such long spears required both hands so no one here has a shield in hand, which is good. Several carry one on the back, which would be useful if they had to resort to using their secondary weapon, although it is unclear how common such shields were. Almost all of these men carry a sword as a second weapon, with just one having an axe and one a mace. Contemporary accounts speak of axes as being common, so perhaps more should have been provided here, although again axes may have been a feature of poorer soldiers than those depicted in this set. While you could debate at length how well clothed and equipped Scottish schiltrons were, we thought the lack of variety in poses, coupled with the very disappointing way in which the long spears have been handled, were serious flaws in this set. Other Strelets sets have provided more spearmen, which does help, but this is not one of Strelets better efforts and will require much patience from the customer.